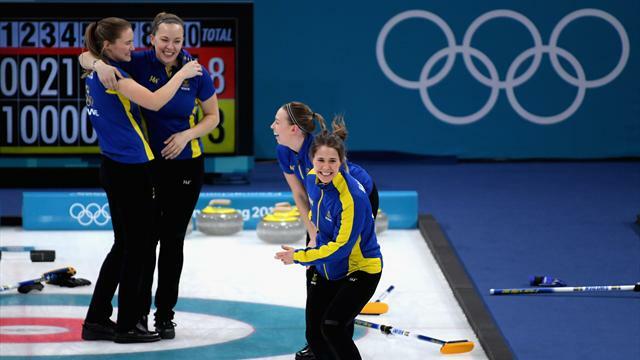 While Sweden confirmed their status as the dominant force in women's curling, Korea's silver marked a major Asian breakthrough in the sport with two teams on the podium after Japan defeated Britain on Saturday to take the bronze. The only previous Asian team to win an Olympic medal were China's women, who won bronze at the 2010 Vancouver Games. With a Swedish rink in the final for the fourth consecutive Olympics, Anna Hasselborg's team played with cool confidence while the charismatic Korean four from a small garlic-growing county who had been thrust into the global spotlight, seemed to finally wilt under the immense pressure. One of four golds to be decided on the final day, Korean fans packed the Gangneung Curling Centre to support the 'Garlic Girls'. It was an upbeat start that began with a roar when the Koreans scored the first point but the mood slowly soured as Sweden took control. The Swedes hit back in the third scoring twice on a last stone draw from Hasselborg that triggered groans from the crowd. In the fourth end with Sweden lying shot rock, Korea skip Kim Eun-jung attempted a raised take out that backfired and allowed the Swedes to steal a point. There was more trouble in the fifth for Korea when Kim Eun-jung failed to take out two Sweden stones leaving one for another steal. Korea scored one in the sixth but handed the hammer back to Sweden, who put the match out of reach the next end with a three to surge ahead 7-2. Korea got one back in the eighth but when Sweden answered with a single in the ninth the Koreans huddled and after a brief discussion walked over and shook hands. They then lined up turned and bowed before leaving the ice to a standing ovation in tears.